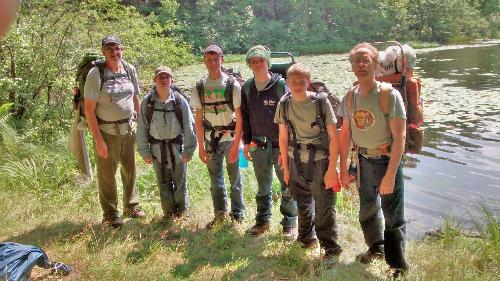 Each Boy Scout Troop belongs to a church, a school, or some other community group, which is known as their Charter Organization. 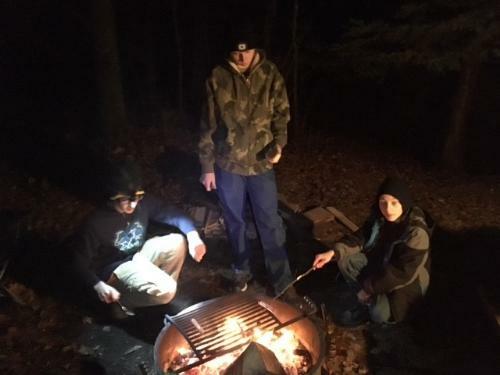 Boy Scout Troop 1052 is proud to be chartered by the Denmark Lions Club in Denmark, WI. Meetings are held every Tuesday (during the school year). 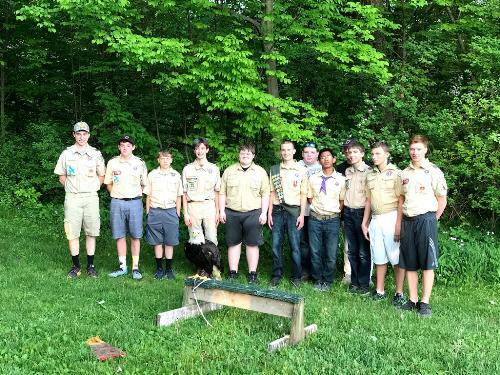 The meetings are held at the Scout Cabin, starting at 7 PM and ending at 8 PM. 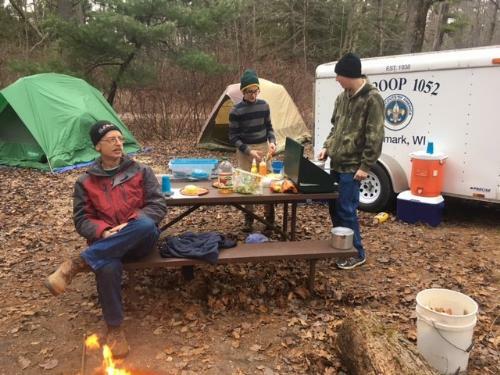 On February 26th, 2019 the boys went to Get Air in Green Bay as a fun field trip for a scout meeting. On February 2nd, 2019, a few of our scouts went to Green Isle Park in Green Bay to defend our 2018 Rendezvous Championship. 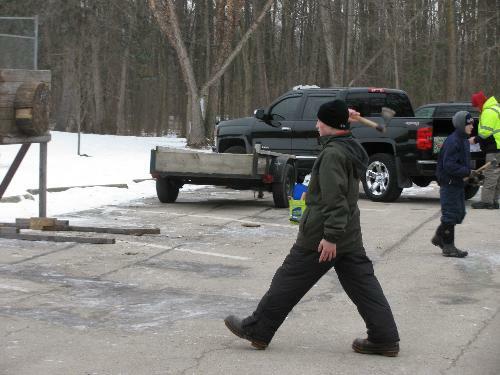 They came up just short of a sled race victory and enjoyed the many activities offered by the Voyageur District. 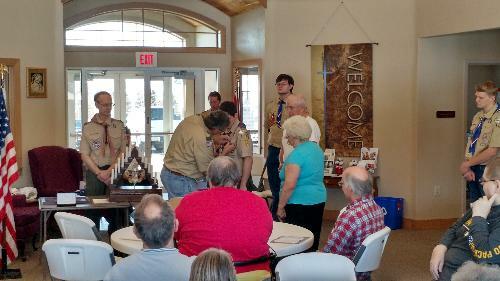 On September 30th, 2018, family, friends, and scouts of Troop 1052 gathered at St. James Church in Denmark, Wisconsin to celebrate Connar Christensen's achievement of the Eagle Scout rank in Boy Scouts. 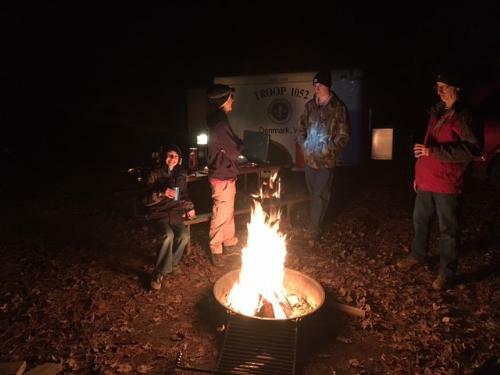 This event included a candle lighting ceremony by the troop and visits by Charlie from Denmark's VFW and Representative Glenn Grothman. 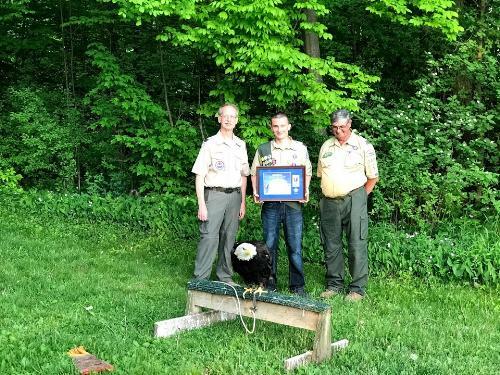 Alec achieved Eagle this year and had his ceremony at the Scout building, which included a live eagle courtesy of the Wildlife Sanctuary in Green Bay. Alec has done a lot of work for the Wildlife Sanctuary including his Eagle project. Great job Alec! 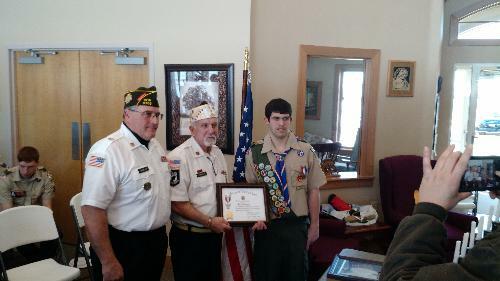 Alex Sidwell of Troop 1052 held his Eagle Scout Ceremony at Christ Community Lutheran Church in Bellevue, WI. 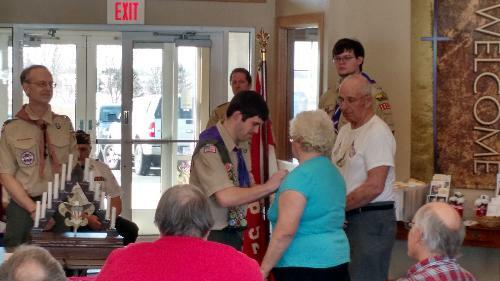 He received his Eagle Scout Award and was honored by members of the Denmark, Wisconsin VFW Post 6705 with a flag folding ceremony and plaque. Action 2 News made it out to cover the event (link below). Alec's Eagle Project Crew 2017. He and his crew built a raccoon rehab cage for the Green Bay Wild Life Sanctuary. Alec Teresinski with His Eagle Scout Project 2017. 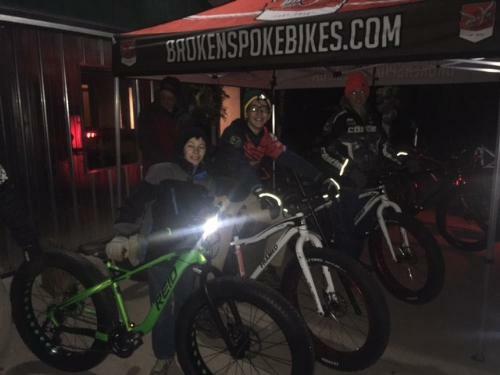 Overnight campout followed by a Fat Tire bike ride. Ryan, Gus, & Connar had a great time. 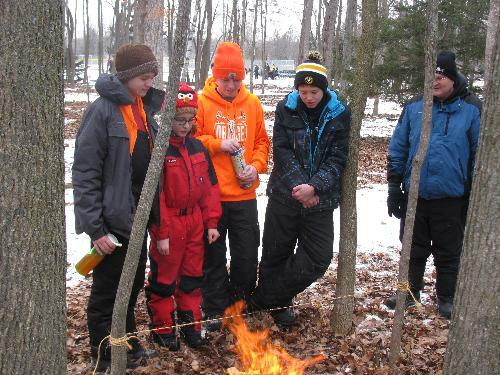 Scouts took first place at this years Winter Rendezvous. 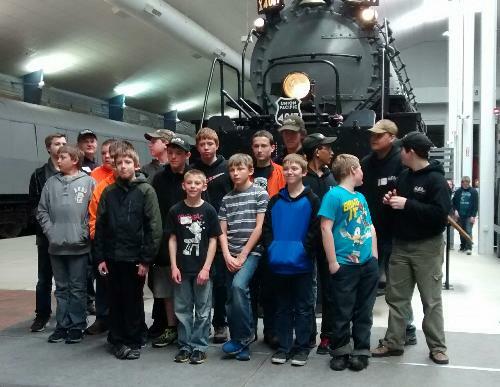 Guys had a great time at the over night at the National Railroad Museum. Ended coming home with the Railroad Merit Badge. 27 Mile Backpacking Trip. 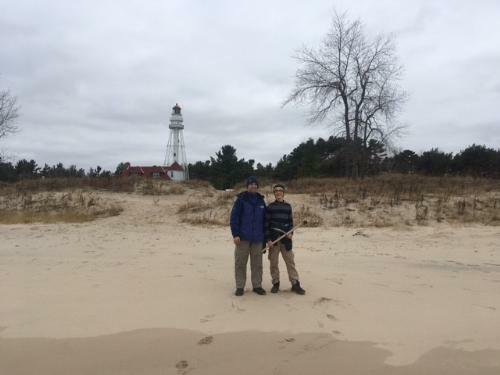 From Mellen to Drummond WI. The North Country Scenic National Trail. Seven days and six nights of fun. Four of the nights we had our own private lake to fish and swim in. 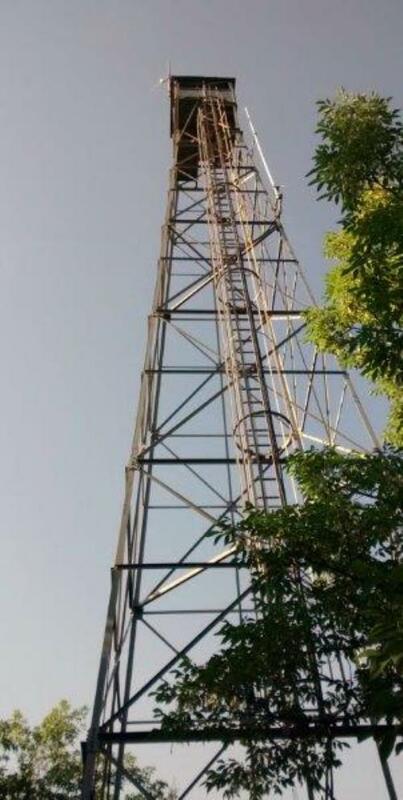 One night we stayed at the base of a decommissioned Fire look Out tower. One night stayed at a trail shelter(wood Shed)overlooking a large stream and a small spring feed creek to get water from. All had a great time. Time to start on next years canoe trip.